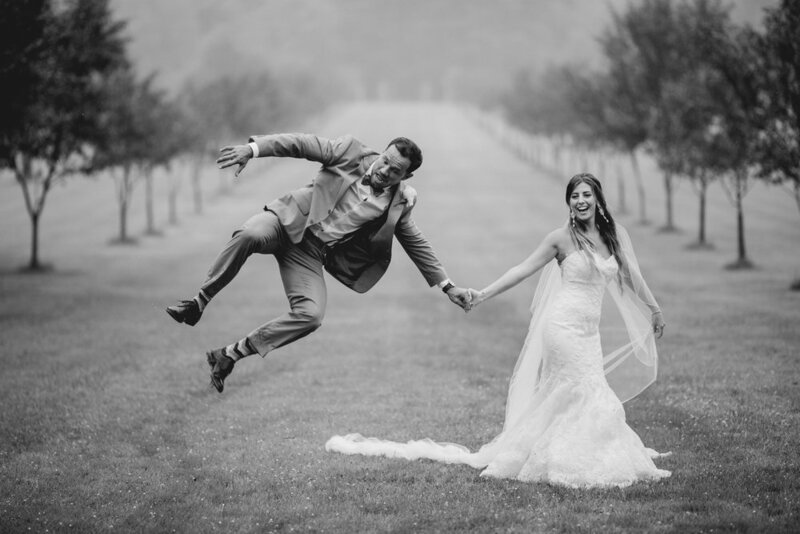 We have all seen incredible fantasy wedding day photos like these. Photographer,Michael J. Ramos, is the real deal and so are his clients. I have admired and followed Michael's talent from the beginning. His eye for composition and architectural detail is what drew me to his work. Michael is known to do just about anything to get the shot, including "jumping in". While his amazing captures are once in a lifetime shots, what happens after the snap? What happens when your dress is a mess?! I always say one day I will write a book about my design experiences. I have so many interesting stories and many favorite clients. Rachel McKnight is one of them. Rachel came to Headpiece.com as a veil lover. She imagined her veil having its own life on her wedding day with Michael Ramos behind the lens following its every move. I remember Rachel telling me during her consultation if she had an endless budget her veil length would match it. She wanted the longest veil possible. We designed it to finish at 147" long. Only one other client requested a bridal veil that long, and she was actress Tara Reid. There was a chance of rain and I just really hoped it wasn’t true. We were at the hotel getting hair and makeup done and it was raining and very gloomy. I kept checking the hourly weather, and the chance of rain was about 50%. At that point, I didn’t care as long as it wasn’t 100% chance. I was getting married there. It was my dream. It was how I pictured marrying Blaze, not in a small event hall space. So I made the call and said it’s at the Botanical Gardens no matter what! I went on my Facebook and in capital letters wrote: THE WEDDING IS STILL TAKING PLACE AT THE GARDENS! BRING AN UMBRELLA! As I walked down the aisle, it did not rain, and for the ceremony it did not rain. It seemed to stop just for me, or I'd like to think it was my dad clearing it up. Afterwards, during the pictures it started to rain a little bit and I ended up looking like a wet dog. The whole day was more misty than rainy . My dress was so dirty after I left the gardens, but I didn’t care at that point. I was so happy I made the decision to get married there. The woman at the venue assigned to my every need, was literally washing my dress in the sink and then drying it. It was pretty funny. If I had to go back, the only thing I would only change is the weather. At the end of the night, Michael J. Ramos proved a dirty Enzoani wedding gown could be absolutely stunning! The Wednesday before my Saturday wedding, there was a pretty consistent forecast for morning rain and 85% humidity by early evening. Early in the day, I was hyper-aware of letting the slightest speck of dirt touch my wedding attire! Dress and veil carrying duties were delegated to my bridesmaids (and flower girl!) as the day progressed. I will never forget Abbey looking at me right before we walked into the church, just drowning in my veil and saying "Wow this is so much fabric!!!!" By the time we got to the reception, I had changed into my shorter veil and bustled my dress. After the first few dances, the bustle came undone, and my dress literally swept the floor. I tried to adapt by holding my train with the wrist loop....until that broke too! 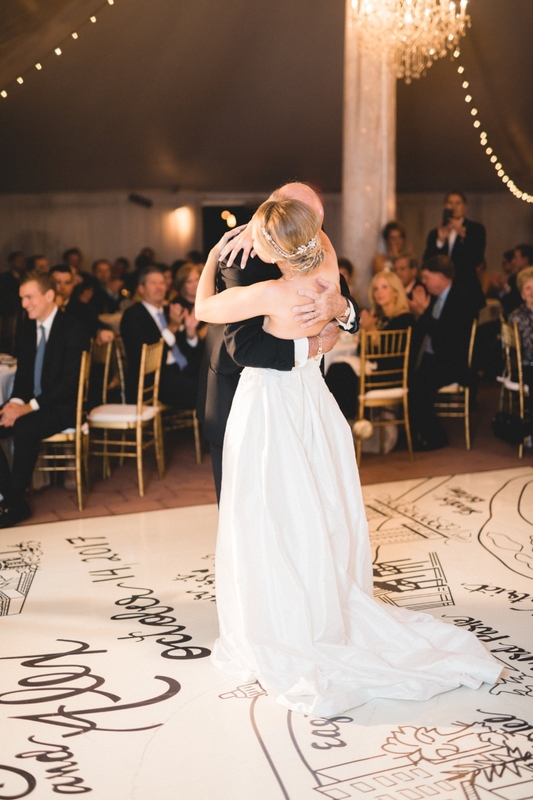 This photo of dancing with my dad is even more beautiful because of it. Add in a few glasses of champagne, a day's worth of adrenaline and not a care in the world (sorry Mom!) and my "diamond white" silk slowly turned to a lovely shade of "autumn dirt". Our last song of the night -- Piano Man -- made for the perfect storm ...yet best encore! I went in for the final dip without enough notice to my poor husband and we hit the floor surrounded by our best friends. We recovered quickly, but my Lea-Ann Belter Valentine dress unfortunately didn't! Mother of the bride, Donna Ciavarella, came to Headpiece.com for a consultation in November. She wished to have something designed from her wedding gown as a surprise gift for her daughter for her February wedding. Donna's dress had been cleaned and preserved in 1984. Together, we opened the box with her wedding gown inside for the first time. In the eighties, wedding gowns were preserved using acidic tissue paper and enclosed in a box that was then sealed in plastic. Brides were warned to keep the box sealed so the preservation wouldn't be ruined. Donna was so excited to see her wedding gown again after being entombed for over thirty years. The thought of surprising her daughter with something handmade from her wedding gown made her so happy. Donna was heartbroken when she opened the box and discovered the condition of her wedding dress. There were stains just about everywhere. The process of cleaning and preserving was very flawed..
After seeing the condition of Brielle's dress, I knew exactly where to take it to try to bring her gown back to life. Spray tanning will always stain the inside and outside of the dress. If the wedding dress is made from a natural fiber, such as silk, it will be more difficult to remove. This was the result of a fabulous wedding day and outdoor reception! I met with Donna Serino at Hallak Couture Cleaners in Hackensack, NJ. My desire was to learn more about the delicate process of wedding gown cleaning and preservation. 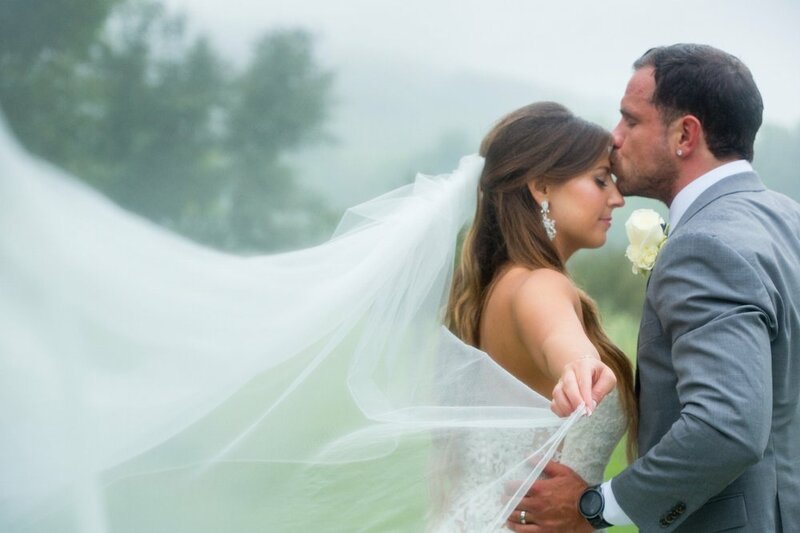 "Were my expectations too high for saving Brielle's wedding gown?" Mark, the front end supervisor, summoned the team who would work on Brielle's wedding gown. Laura unveiled the dirty dress and inspected the gown and lace jacket for sewing repairs. José Rodriguez is Hallak's master dry cleaner technician who would provide all of the answers. I asked him, "On a scale of one to ten...how bad is Brielle's dress?" José replied, "A nine!" I visited Hallak on four separate occasions to document the results. We had our work cut out for us! José began at Hallak in NYC as a delivery boy in 1988. 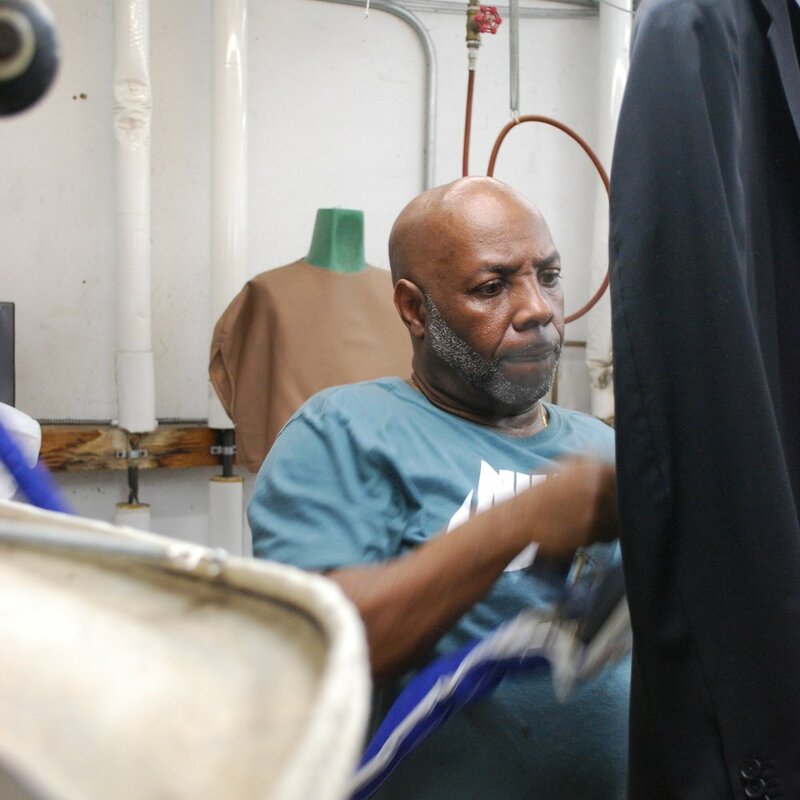 The original founder, Mr. Joseph Hallak Sr, piqued José's interest in the dry cleaning trade and prompted him to attend National Cleaners Association and New York School of Dry Cleaning. He is valued at Hallak with over twenty five years of experience. It is evident that the technicians take incredible pride in providing the best service in country. They can clean anything at Hallak Cleaners and I believe them! Hallak cleans and preserves wedding gowns for brides from all over the country and offer shipping services. I noticed a beautiful ornate wedding gown hanging next to Brielle's. 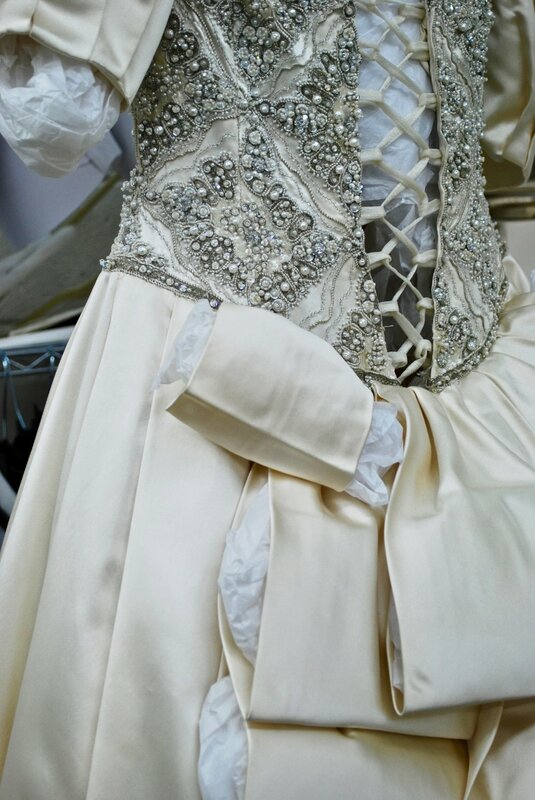 The gown was just released from storage to be refreshed. The intricate beaded detail intrigued me and I began to snap some pics. I recognized this wedding gown as Mariah Carey's from her first marriage to Tommy Motolla. Hallak Couture Cleaners is also known as the cleaners for the stars! It was time to begin the journey to clean Brielle's dress. I was amazed at how much work and expertise is put into the process. José began by choosing the proper chemicals to treat the mess on her hem. Pre-treating Brielle's silk hem took an hour and a half. The first step is done by hand with a brush and rag. Her dress was then put into the Perc machine for dry cleaning. The machine looked similar to a washing machine. I asked José to help me to understand why they call it dry cleaning but it doesn't look like "dry" cleaning. The chemical is a dry solvent. With a dirt rating of nine, Brielle's wedding gown needed much more than traditional dry cleaning. Her gown needed to go through a second process called "wet cleaning". Think of it like a wedding gown bath. Her dress was soaked overnight and then hung to dry---TWICE! Finally, I was beginning to recognize the Lea-Ann Belter wedding gown we had fallen in love with at Something Bleu Bridal in Saratoga Springs just thirteen months before. José was very satisfied with his efforts. He prepared me that there is never any guarantee of stain removal. With a dress as soiled as Brielle's, his hopes were to remove 80% of the stains. He exceeded that and removed 90%! Next, was the easy task of spot cleaning Brielle's wedding veil. Brielle and her bridal entourage took incredible care of her veils that we designed. This made me happy! 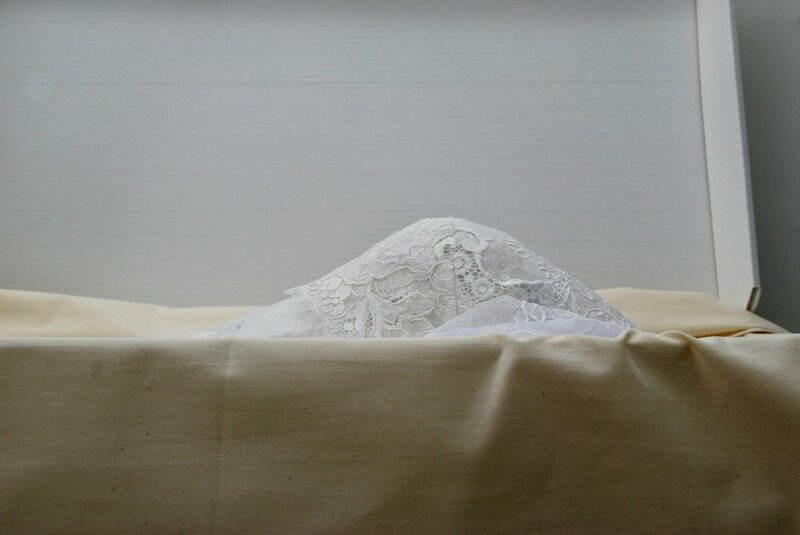 Stained French lace on Brielle's bridal veil. Brielle's headpiece and veil were ready to be stored. Hallak Cleaners provides couture services and repaired Brielle's wedding day imperfections and tears. I love this photo but admit it also makes me a little sad. How could the time have passed so quickly from the memorable adventures of choosing her gown? Mission accomplished! Times have changed since wedding gown preservation during the eighties. Today's preservation techniques will allow Brielle to take a peek at her dress now and then. 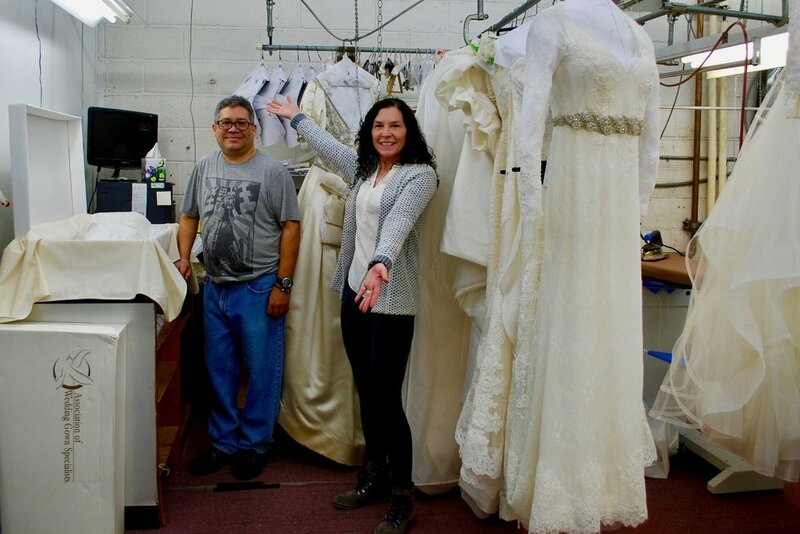 Her dress has been cleaned by the best, preserved by the experts...and oh did it have so much fun on October "Fourteenth"! 1-Don't try to treat any stain yourself. You can set the stains and cause irreversible damage to your dress fabric. 2-Take your dress ASAP to a reputable dry cleaner who is trained in heirloom garment cleaning and preservation. The longer you keep a dirty dress in your closet, the more impossible it is to clean it. 3-Inform the dry cleaner of all stains that you remember--champagne, 7-up, beer etc.. Invisible stains are the worst and will cause rusty oxidation stains over time that will become permanent! 4-Don't look for the cheapest dry cleaner. I never knew how tedious this process was until I watched it being done. 5-No matter where you are located in the country contact Hallak the Couture Cleaner for their expertise. We have so many blogs in the works. Stories that will amaze you and touch your heart. Check in next month as we follow Shannon Post and her quest to keep her mom in her heart and present on her wedding day.